When Will I Get My Accordion Fold Newsletters? 5,000 and under Accordion Fold Newsletters: Ships or ready for pick up in 2 business days from proof approval. Over 5,000 Accordion Fold Newsletters: Ships or ready for pick up in 5 business days from proof approval. Use accordion fold newsletter printing for your next newsletter and readers will take notice! The online newsletter printing services of 48HourPrint.com also give you high quality accordion fold newsletter printing and more for your money. And you get the benefit of our industry-leading 48 Hour Turnaround Time Guarantee for quantities of 5,000 or fewer newsletters. Accordion fold newsletter printing creates a refreshing way to deliver newsletter content. The unique design has the feel of a single-, double- and triple-panel newsletter all in one! Use the accordion folds to your advantage in laying out text and graphics that will draw in readers and carry them throughout your newsletter. 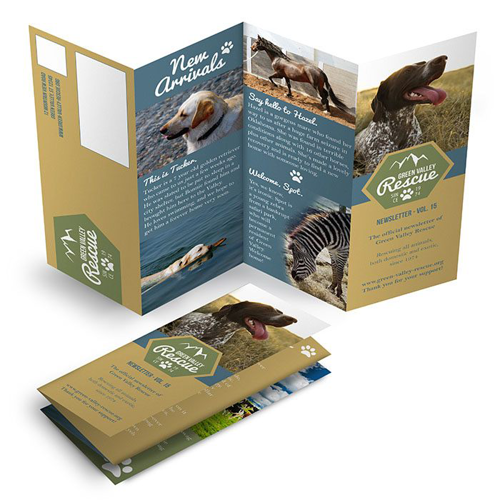 Accordion fold newsletter printing can enhance the delivery of your key messages and keep readers engaged. In addition to our single fold newsletter printing services, you can also choose from no fold newsletter printing, single fold newsletter printing, tri-fold newsletter printing, double parallel fold newsletter printing, french fold newsletter printing, roll fold newsletter printing, and gate fold newsletter printing. We have newsletters covered!